Franklin County, founded in 1808, is one of very many in the United States named after Founding Father and renowned inventor Benjamin Franklin. The county is located in the far northern tip of the state and borders the Canadian provinces of Ontario and Quebec. 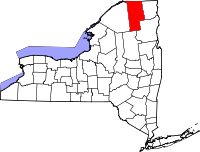 The county seat of Malone, NY, is home to the Franklin County Historical and Museum Society. Located at 51 Milwaukee Street, the Museum has a huge number of local historical books, documents, and records on file available for the public to research and view. The Society performs research projects from requests sent by mail, by calling (518) 483-2750, or by email. Also in Malone, at 355 West Main Street in Suite 248, is the office of the County Clerk, the local registrar for a number of records which include cemetery records dating from the late 1700s to the present, civil court records listed by surname from 1808 to the present, and much more.